Continuing our look at some of Nerf's latest blasters, we get to the big fella. Imagine if animals could be killed by rubber-tipped foam darts. And say you were hunting an elephant – nay, a herd of elephants all armed with knives and a hatred of humans. You'd need a pretty big foam dart flinger, eh? 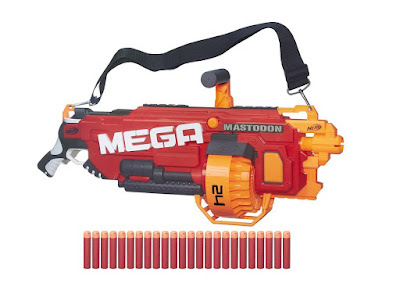 That's just what the Nerf MEGA Mastodon is. Here is what we made of it. 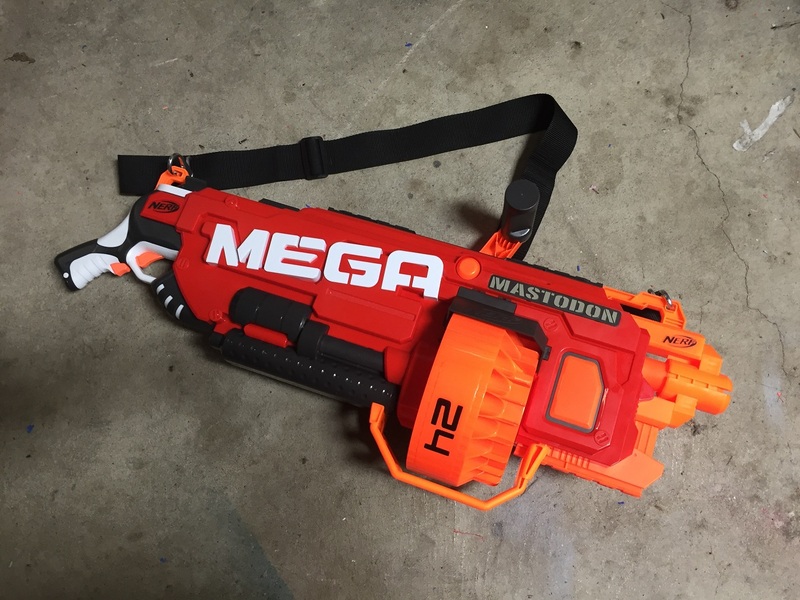 First up, this is a MEGA blaster, meaning it shoots the larger orange darts, just like the MEGA Centurion and the MEGA Magnus. This means that everything is scaled upwards, to accommodate the larger ammo. But, with the Mastodon, it is almost as if Hasbro have decided to build something as big as they can feasibly fit inside a box and still call it a toy. The weight of the Mastodon is the first thing you'll notice, so the included shoulder strap isn't really an optional extra. Once on, it still weighs heavy on your body, but is actually quite comfortable to wield, two-handed. The foremost grab is flexible in that it rolls backwards and forwards, while the trigger grip is angled far back to make it easier to hold. You assemble the 24 dart drum from three separate parts (otherwise the box would even bigger than it already is), and clip on a protective cage underneath it. There are two tactical rails on the top, and one on the bottom, perfect for a bipod (such as the one that came with the Centurion, maybe?) to set the whole thing up to fire while laying down. This is important to know if you're thinking of buying one: it takes six D batteries. Yeah, six. Not only do those chunky batteries add even more to the weight, but they'll bump up the overall cost as well. Something to bear in mind if you're getting it for someone else. Yes, very well! It is a real pleasure to fire this thing, as it genuinely does feel powerful and intimidating. Sure, the fact that you can't quickly change the drum for another pre-loaded one could get old in a battle situation, but loading the darts into it is much quicker than reloading darts into the likes of the Hyperfire's drum. 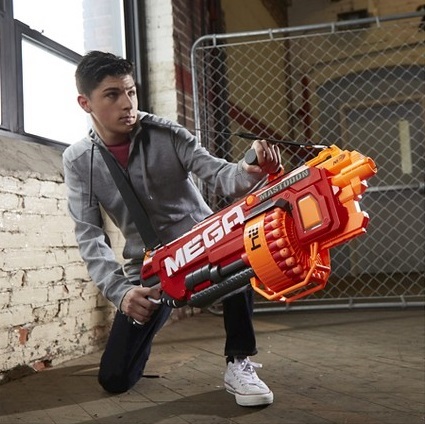 It may be too large, heavy, and ungainly for many, but if you want to appear to be a pretty terrifying presence on the battlefield, you need the Nerf MEGA Mastodon. And, we don't know, a scary clown mask or something. We wouldn't mess with that.